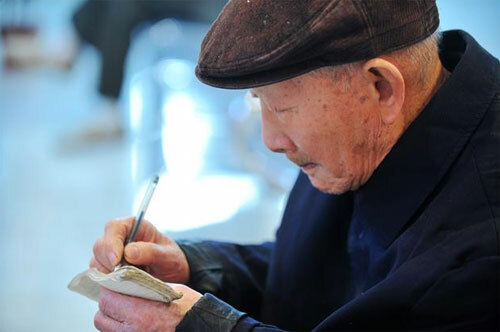 CHANGSHA - For 99-year-old Lu Fumin, the secret of long life is simple. Every weekday morning a nanny helps him out of the house - and straight to the stock market. "Playing stocks really spices up my retirement life," he said. "Life used to be a little bit lonely so I thought of coming here. It's better being with everyone here than staying at home all by myself." The retired railway worker from Changsha, Hunan province, spends the day in a stock trading hall near his home, closely watching the green and red numbers flashing on the big screen and placing buy and sell orders on the computer. His eyesight is still good and his mind is clear, which is good for stock investment. On the other hand, he plays stocks to have fun and exercise his brain. "That is the secret of my longevity," Lu said. When it comes to investment, he said there is no secret other than having a good state of mind and knowing how to collect useful information from the newspaper and business programs on TV. "Ups and downs are normal in the market. I've always told myself don't be too happy when it rises and don't worry too much when it falls," he said. Lu stays at the hall until 3 pm, when the nanny hired by his son brings him home. He has kept this schedule for 13 years. Some people might think investing a part of their life savings in the stock market is too risky for elderly people in China, who have expenses like medical bills to worry about. Yet Lu is characteristic of old people in China who play the stock market, some for the fun, some out of loneliness, some for the challenge. Experts say older investors in the stock market should adopt a more conservative approach. "The tolerance for risk tends to become lower when people get older, so the amount of money they have in the stock market should be gradually reduced while they age," said Zhang Xin, a financial advisor at China Galaxy Securities. "For older people, preserving their money should be the primary investment strategy rather than growing it." Lu said he had bought shares of Zhongjin Gold Co Ltd, China XD Electric Co Ltd, Haikou Agriculture and Industry and Trade Co Ltd, but he only managed to pocket a profit of 20,000 yuan ($2,900) in the past three years due to the volatile market. "I once made 50,000 yuan back in 1997 but the market hasn't been as good these last few years," Lu said. "Luckily I still manage to make some profit, and as government policies become clearer the market will get better." Some of Lu's fellow investors at the trading hall think what Lu does is remarkable given his age. "He's quick and doesn't wear glasses. It's really remarkable for someone in his 90s to still operate a computer and play stocks," said Wu Genliang, one of Lu's friends at the trading hall. "Many old people are afraid of being alone. But loneliness doesn't exist in Lu's life when he's with us," Wu said. For 99-year-old Lu Fumin, the secret of long life is simple.